I have online classes and a blog post once a week, and have a few ebooks, and actually just turned one of my online books into a print book. Since I’m a garden educator, and I spend a lot of time gardening and I know a lot about gardening, I think a lot of people assume I grew up in a farm, but I actually grew up in a row home in Philadelphia, I didn’t know anyone that had a garden, I never even thought about gardening or how vegetables grew. I didn’t have a lot of experience growing up. I do have a very faint memory when I was very young, my mom experimented with having a backyard garden. She was successful at growing mint and she would send me out to the back yard to get mint for the ice tea. I think it had a bigger impact on me then I realized and sort of manifested it on me as I grew up. Megan’s About Page is a must read. I don’t know how to garden any other way, cause that’s the way I learned how to garden, so sometimes I joke with people I wouldn’t even know how to tell people how to garden non-organically. Paying attention to soil health because that supports all of my plants. Then when I am having an issue in my garden, I start researching it, try to figure out what is the pest, how does it live, or function in the garden, what are the steps I could take to try to get rid of it out of my garden. Looking into any kinds of problems in my garden instead of looking for a quick solution in chemicals, and there are some thing I have stopped trying to grow in my garden because it’s such a struggle to try to grow them organically, I have given myself permission to give up. I consider myself a strategic gardener, and I love to spend time in my garden but I don’t want to waste time in my garden. So I definitely want a garden that produces as much food as possible, and I also want a beautiful garden because my garden is in my front yard, so I see it all the time and out my window. I demand a lot from my garden. I’ve seen a lot of people’s gardens.The majority of people are not getting the most out of their gardens. A lot of people could be more strategic and produce more food. Well, I talked a little bit about my earliest gardening memory, but in my 20’s I was still living in the big cities, I don’t know where it came from, but I started to think about gardening and I wanted to learn how to grow food. So I applied for an organic gardening internship and moved to a small intentional community in Missouri, and I was an intern there for a season. One of the first people I met was probably I don’t think was particularly skilled gardener, he was trying to grow a lot of food for a lot of people. I learned a lot about what not to do. Remember waking up in my tent and my hands would be clamped close. There was a lot of labor, they didn’t use any machinery, so it was pretty intense labor, so maybe now I go to great lengths to not have any weeds. Definitely learned a lot at that internship. Then I stayed there and took on the herb garden there with another more experienced gardener. Ended up staying and living at that farm for a year and a half, after my internship which was only 6 months, eventually I met my husband there, and we started our garden there as well … I started to plan and just kind of learn. . . I made mistakes, and learned from my mistakes. If you don’t have time to commit to an internship, what I have done since then I was just a worker share on a CSA farm. I was a garden educator, but working on a CSA farm, a smaller CSA just 5 acres, they’re so focused on production, variety, and efficiency and a lot of the things we don’t think about as home gardeners, but I felt that a lot of those things could translate to help home gardeners. I wrote a blog post called “Think like a farmer” about things that farmers do so we can become more efficient home gardeners. In Wisconsin we usually harvest it the last two weeks in July, starting to dry in the garden, starting to turn from green to brown, tie it up in bundles of 10 just let it dry in my garage rafters. Sometimes I don’t get to cutting it down till September. Trying to experiment with some season extension. Had great success this spring, built a hoop over one of my raised beds and used pvc and plastic. Planted 11 different things in it in early March, which is way early for here in Wisconsin, usually can’t grow anything until mid-April. I harvested my first big bowl of salad right around April 13th and since then I have just harvested spinach and salad and some scallions that overwintered from last year. I continue to experiment with that to see how far I can push things and see how long I can preserve things this fall. On Christmas I harvested spinach, arugula, and baby bok choy, and some turnips for Christmas dinner. I have used seed mats, heat coils that I put in the soil to warm up the soil. Peppers like 80-85 degrees temperature. This year I used the seedling seed mat, and the heat coil together. Garlic, I would definitely do that. 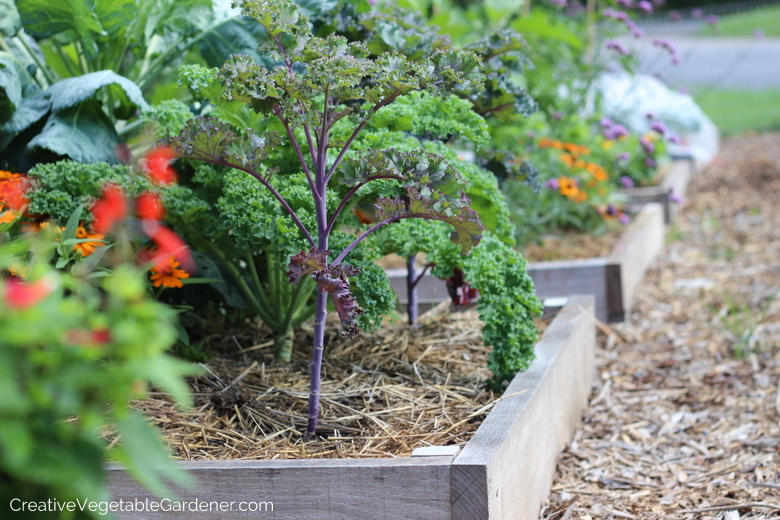 I think in my area Kale is really easy, there’s not a lot of pests, I’ve found success with pretty much all of them, you can plant it early in the season, it lasts into the fall, and you can eat it all year. Spinach is one of my favorites, especially fall planted spinach, somewhere near August, then harvest all fall sometimes up to Christmas, and then I mulch it and in March when things are starting to thaw out feel like I just pull the mulch off and things are starting to grow and then you can be harvesting spinach in early April. In our area, I would say any kind of melon, watermelon, cantaloupe. We have a pretty short season and melons require a pretty long season. A lot of the farmers in our area, use black plastic in their fields to increase the heat of their soil. People really love to grow if they can successfully, but it can be difficult to grow successfully in this area. Cauliflower is really difficult as well, it really depends on what variety you grow, goes from perfectly ripe to overdone pretty quickly. Sometimes I talk with people who have a small garden, about winter squash and pumpkins that take up a lot of room. You don’t get a lot of butternut squash from one vine which takes a lot of days, I think it is a personal choice about what is worth it for you. Might be better to buy large amounts of squash at farmer’s market in the fall when they are inexpensive at the height of the harvest and store for eating all winter. Think about how many days something takes to grow. Mulch – any time that there is bare soil, weeds are going to grow, that’s their job, they’re trying to hold the soil down so it doesn’t erode and blow away or wash away so they are just doing their jobs, so I try to set up my garden, so they don’t need to do their job and there is no bare soil. I like to use marsh hay, grass clippings and leaves, straw, just make sure of your source and that you’re not importing more weeds into your garden, sometimes hay could be someone who cut their weedy field. 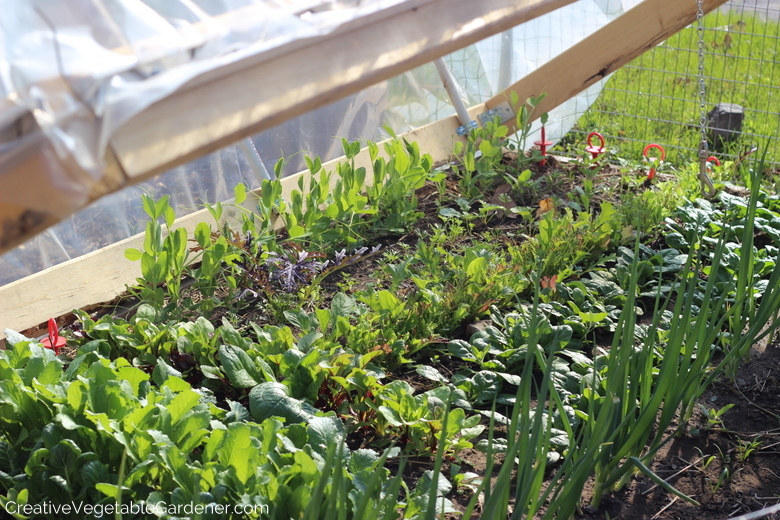 Different pictures on my Creative Vegetable Gardener website, always have all of my beds, all of the soil is covered with hay mulch, there is no visible soil. Unless I am waiting for something to germinate and as soon as it pops through the soil and grows a little bit, I’ll mulch it with hay. In my aisles, I don’t like to have grass around my vegetable garden I get rid of grass and cover up with cardboard and wood chips. Ask some questions about where it’s coming from to make sure it’s doesn’t have a bunch of weed seed in there. My recent favorite activity because I post a lot of pictures and I think gardeners are really visual people. Last summer I decided I wanted to up the quality of the pictures on my site, so I invested in a better camera, and I actually took an online photography class, practiced taking a lot of pictures and capturing a lot of the beautiful moments. And I loved it more then I expected, because a lot of time last summer in our garden we’re working, we have our to do list, … whereas when you’re in there and you’re taking pictures and I just felt like I was IN my garden, and I was looking at things closely, and I was appreciating the colors and my eyes were always searching for something beautiful to take a picture of. It’s like a meditative exercise and a chance to see my garden, instead of just always working in my garden. Certain varieties that do better then others, so often when people talk to me about red peppers I always ask what variety that you grow. That’s what makes me feel rich, when I have a whole bucket of red peppers, I feel giddy, and like I have something that’s so valuable. Mostly sweet red pepper, I do a little bit of spicy peppers for salsa making. I freeze a lot of peppers and chop them up and put them in the freezer. Just remove seeds and stems, and chop them up and actually I put them in canning jars in the freezer. I really love to hear about the details of other people’s gardening methods, and their techniques and their experiences, I just pick up little things here and there and think “oooh that’s a great idea I’m gonna try that.” A lot of times I think its the little nitty details. With the hoop again, the Year Round Vegetable Gardener by Niki Jabbour, really inspired me to figure out how to extend my season. Especially since I live in a northern climate try to see if I can add some weeks or months to either end of my seasons to try to get a little more out of my garden. A favorite tool that you like to use? If you had to move and could only take one tool with you what could you not live without? The digging fork, is what I use the most, the Potato digging fork, kind of a squared off, usually has 4 tines. I use it for everything, but I particularly use it for weeding, I used to run a youth farm, I wouldn’t let anyone weed with hand tools, because it’s so hard to get the roots out with hand tools, so I made everyone weed with a digging for so we could pop everything out by the roots. How do you get the weeds out without removing the plants? It’s not hard, definitely possible, sometimes you have to jiggle the soil, so I’m not taking a big clod like with a shovel, so I just wiggle the soil, and then wiggle out the weed, just kind of loosen the soil and then pull the weed out. I try to eat locally as much as possible all year round, I put lots of food away, but I don’t like to can, I like to do whatever is the quickest and easiest way, to store vegetables. Super Easy Food Preserving is my ebook that I turned into a print book. Most of the different common vegetables and some fruits and herbs, I talk about easiest way to put them for off season eating. I store onions, garlic and winter squash in my basement so there’s no processing necessary. We talked about red peppers that just get chopped and put in the freezer. Some things need a little bit of processing, before you put them in the freezer, if your interested in putting some food away and you don’t want to can I recommend to people to invest in a chest freezer. So many things you can put in the chest freezer. Just taking out a bags and jars and a handful of corn, peppers, broccoli, so it’s more like assembly because I did a lot of the prep when I was putting things in the freezer, so it’s more efficient in a way. I like to remind people, you don’t have to grow everything you want to preserve. Last year I bought a huge bag of broccoli in the fall and froze jars and jars of it. I steam it till it just turns green and dunk it in a bucket of ice water. Okra, have grown okra in the past. Loved okra when I lived in Missouri and I have a friend who grows it and saved some seeds. It’s real beautiful, in the hibiscus family, grows really tall like corn and it has a beautiful flower, kind a of like hibiscus flowers. I have a couple of ways to cook it that I love. My favorite way to cook it is to just cut it up coin size slices, throw it in the pan with olive oil with corn meal and salt and just saute it. The think the thing I eat the most, is just a spinach salad. We have salad almost every night, if there’s spinach or local stuff available. Don’t really cook any spinach. Just eat it raw. We really eat so seasonally. Gonna go to the farmer’s market and hoping someone has asparagus, I have a few asparagus dishes I like to cook. 101cookbooks.com a woman who has written a few cookbooks, is a great photographer and it’s a visually pleasing site. And you can search by ingredient. 101cookbooks.com I really like for recipes, I have to recommend my own Creative Vegetable Gardener website. If you live in the NWedible has a very unique voice. Lee Reich, has written a few books about perennial berries and fruits and not trying to battle with things that are hard to grow, figuring out what are the easiest berries and fruits to grow and trying to grow those in your yard. I read a lot, I love books, I love the library. If I hear about a book, I see if my library has it first. Then I’ll read the book from the library and if it’s something I like, I will potentially add it to my own library. Organic Gardening Magazine which is kind of fun to read. Perennial Gardener’s Design Primer – Stephanie Cohen also has a blog (the Perennial Diva), more about perennials and flowers – she has an amazing eye. Grows some really unique things and her picture heavy blog is lots of fun. Perennials are flowers that come back every year that you don’t have to reseed, and annuals you have to plant every year. Used to work for a non-profit, where I developed one of the first kids programs in Madison, and then a youth farming program in partnership with the schools. If you want to become a garden educator. First find if there is an organization in your town that’s doing education in your town and see if you can volunteer? and see how they do it? and how the garden education world works if you don’t have any experience. I think for me of course, gardening ties into it all, I’d love to see more people at least, I don’t think you need to grow all of your own food especially if you live in the city but to grow some of your food, and get that experience. I think it gives you much more appreciation of where food comes from, how long it takes to grow it, how difficult it is to be a farmer. And I think people who grow some of their own food, will be more likely to go to a farmer’s market and buy from farmers, or to pay attention to where their food comes from. I think the industrial food system has a lot of problems with it, and certainly in our country the fact that California is in such a severe drought and we get a lot of our food from California. Learning how to grow just a little bit of your own food. It’s a really empowering experience to know that you can provide for yourself. So especially in the United States learning how to grow at least a small portion of their own food, we used to do it, so we can do it again. Mindfulness in the Garden, Zen Tools for Digging in the Dirt. We live in a busy world, and we spend a lot of time with technology and running around and I think the deep joy and the deep stillness that gardening brings to my life is really one of the greatest gifts. Sure it’s wonderful to learn the skills and techniques and to grow the food. There’s the doing in the garden and the being. It’s the being that’s so important in my life and others’ a way to connect to myself and to nature and just connect to the stillness that’s out there and within myself. To join Megan’s community visit her Creative Vegetable Gardener website and sign up for her email so you can receive a copy of 5 MISTAKES TO AVOID IN YOUR GARDEN RIGHT NOW!